From: Lawson, J.D. and Weedon, D.S. (editors). 1992. Geological excursions around Glasgow & Girvan. Glasgow : Geological Society of Glasgow. The Geological Society of Glasgow is grateful to the following companies and organisations for their financial contributions towards the production of this excursion guide. Bluck, B.J., Department of Geology 8z Applied Geology, University, Glasgow, G12 8QQ. Bowes, D.R., Department of Geology & Applied Geology, University, Glasgow, G12 8QQ. Bowes, G.E., Department of Geology & Applied Geology, University, Glasgow, G12 8QQ. Burton, C.J., Department of Geology & Applied Geology, University, Glasgow, G12 8QQ. Durant, G.P., Hunterian Museum, University, Glasgow, G12 8QQ. Gribble, C.D., Department of Geology & Applied Geology, University, Glasgow, G12 8QQ. Ingham, J.K., Hunterian Museum, The University, Glasgow, G12 8QQ. Jardine, W.G., Department of Geology & Applied Geology, University, Glasgow, G12 8QQ. Keen, M.C., Department of Geology & Applied Geology, University, Glasgow, G12 8QQ. Lawson, J.D., 47 Southbrae Drive, Glasgow, G13 1PU. Lawson, Judith A., 47 Southbrae Drive, Glasgow, G13 1PU. MacDonald, J.G., Department of Adult and Continuing Education, University, Glasgow, G12 8LW. Patterson, E.M., 25 Caldwell Road, West Kilbride, KA23 9LF. Rolfe, W.D.I., Royal Museum of Scotland, Edinburgh, EH1 1JF. Tanner, P.G.W., Department of Geology & Applied Geology, University, Glasgow, G12 8QQ. Todd, J.G., "Eastfield", Tandlehill Road, Kilbarchan, PA10 2DQ. Weedon, D.S., 9 Montgomerie Terrace, Skelmorlie, PA17 5DT. Williams, S.H., Department of Earth Sciences, Memorial University of Newfoundland, St. Johns, Newfoundland, Canada. Glasgow can justly claim to have a greater variety of geology which can be visited on single day excursions than any other city in Britain. The first account of these excursions was published in 1958 in Dr D.A. Bassett's "Geological Excursion Guide to the Glasgow district". It was updated in 1973 by the guide edited by Dr B.J. Bluck. A projected guide to the Girvan area never reached fruition. 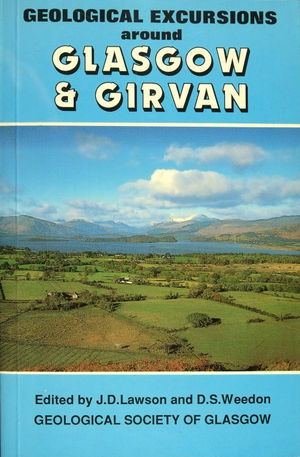 The present guidebook makes good that deficiency by including seven excursions in the Girvan to Ballantrae areas together with illustrated discussions of the fundamental problems. The Dob's Linn locality may seem to be well outside Glasgow's province but it can easily be visited in a day and, indeed, has been a regular excursion for students from Glasgow University. The comparison with the Girvan rocks of similar age has long been a matter of great interest. It is also the nearest locality which yields abundant graptolites and contains the international stratotype for the Ordovician-Silurian boundary; the section has recently been redescribed by S. Henry Williams when a research student at Glasgow University and he is the main author of the excursion account. As for the Glasgow area itself, most of the excursions in the 1973 guide have been retained in revised forms. However the Lugton quarries are now flooded and the Boyleston Quarry has deteriorated considerably although a brief account is still included. The Great Cumbrae excursion has been simplified and Little Cumbrae omitted because of access difficulties. There are new excursions around the Rosneath peninsula, to Loanhead Quarry, on the Old Red Sandstone of the Clyde coast and the Building Stones of Glasgow. Many of the excursions are suitable for beginners in the subject of geology but others are at a higher level. In these more complex excursions, however, an attempt is made to provide guidance for the amateur who wishes to advance his knowledge: there are extended explanations with helpful illustrations. For instance the Firth of Clyde Old Red Sandstone excursion explains the interpretation of some sedimentary structures, the Trearne excursion instructs in palaeoecology, the Balmaha excursion discusses terranes, the Rosneath excursion explains the interpretation of structures in metamorphic rocks and the Ballantrae excursions introduce plate tectonic concepts. A glossary of all except the commonest technical terms is appended and the words listed appear in bold type at first mention in the text of an excursion. The definitions are, however, brief and without illustration. Fuller explanations will be found in the various dictionaries of geology. However it is strongly recommended that the reader should study some elementary texts in order to obtain an integrated picture of the subject. An indication of the standard of the various excursions is given in the subsequent Excursion Planner. Additional geological excursions which can be undertaken in a day trip from Glasgow are included in Lothian Geology (Edinburgh Geological Society) and Fife and Angus Geology (St Andrews University–new edition in preparation). The rapid increase in geological field studies in recent years has often resulted in the deterioration or even destruction of important outcrops and has also caused considerable inconvenience (and even financial loss) to landowners. Visitors are therefore exhorted to follow both the Country Code and the Geologists' Association's "A Code for Geological Field Work" (copies free from the G.A., c/o Burlington House, Piccadilly, London W1V 9AG). Some of the main points are highlighted below. Some of the localities recommended in this guide are Sites of Special Scientific Interest (SSSIs), designated by the Nature Conservancy Council. The function of this body is to conserve the scientific interest of these sites and for that reason their whereabouts are not widely publicised. Whilst the existence of these sites is public knowledge, most of them are in private ownership: designation as an SSSI does not confer any increased rights of access for the public. Some of the sites do not, at present, require prior permission but the usual courtesies should still be observed. The geological visitor is expected to respect their status and restrict hammering to a minimum. In some cases, however, (clearly indicated in the guide) a special permit is required from the NCC to cover access and limited collecting. Where relevant, the present landowner's name and address is provided in the appropriate excursion. If prior written permission is required it is advisable to write several months in advance as the landowner may have to consult the NCC. The local contact address for the Nature Conservancy Council is: The Castle, Balloch Castle Country Park, Balloch, Dunbartonshire, G83 8LX. Tel. (0389) 58511. At the time of writing there are proposals to reorganise and rename the NCC in Scotland, as part of Scottish Natural Heritage. The editors wish firstly to thank the authors for their expert contributions and to their institutions for providing facilities. Special thanks are due to Professor B.E. Leake of the Department of Geology and Applied Geology at the University of Glasgow for providing expert secretarial assistance from Mrs Mary Fortune, Mrs Betty Mackenzie, Mrs Irene Wells and Miss Jeanette Wylie and draughting work by Mrs Sheila Hall. Drs. G.E.Bowes and C.Farrow deserve our gratitude for their unfailing help in solving "Word-processing" problems. Dr. J.P. Burlison of the Nature Conservancy Council kindly took the time to advise us on the Sites of Special Scientific Interest, and their protection. Royal Society of Edinburgh for Figures 10.2 and 10.3, reproduced with permission from Curry et al in the Transactions of the Royal Society of Edinburgh vol. 75, pp. 113–133, Figures 7 and 8 (1984). The commercial organisations who generously donated money to help in the production of this guide are acknowledged separately on page 8. Finally, we would like to express our personal gratitude to Brian and Aileen Evans of Carnmor Print & Design for their patient and friendly advice during the preparation of this Guide. The routes recommended in this guide are not necessarily public rights of way. Responsibility for obtaining access permission lies with the user. Property often changes ownership and even existing owners may change their minds about allowing access to their land, particularly if they have experienced trouble and even damage from geological parties failing to follow the Code for Geological Field Work. Any information (e.g. change in footpaths and access, filling in of quarries, threats to SSSIs, new exposures) that would update and improve a revised edition of this guide would be welcomed by the Society. Acritarch. Single-celled, organic-walled microplankton, probably algae, characterised by varied sculpture, some being spiny, others smooth. They are predominantly Palaeozoic, and are widely used in correlation. Agglomerate. A coarse-grained rock made up of material ejected during a volcanic eruption. Amygdales. Vesicles and cavities in lavas which are infilled with secondary minerals. Anaerobic. A term indicating a condition in which oxygen is absent. Analcime. A mineral, generally white in colour, a hydrous silicate of sodium and aluminium. Antiform. A structural term denoting that a fold closes upward in strata for which the stratigraphic sequence is not known. Aphyric. A texture of igneous rocks where the crystals are of uniform size. Arfvedsonite. A mineral; a sodium, magnesian, aluminium silicate, deep-green to black in colour, often found as aggregates of long, prismatic crystals. Arfvedsonite and other soda-rich amphiboles occur in silica-poor igneous rocks, such as nepheline-syenites. Arkose. An arenaceous sedimentary rock, rich in feldspar, usually close to its source material. Aureole. (metamorphic) The heat modified area of rock surrounding a once hot igneous intrusion. Axial planar. Parallel to a surface which contains the fold hinges in successive layers within a fold. In a symmetrical fold it bisects the angle between the limbs of the fold. Barytes. A mineral, barium sulphate, quite dense and generally white in colour. Bauxite. A fine-grained, soft sedimentary rock rich in hydrated alumina. Grey-brown in colour, it is produced by weathering of certain rocks in tropical conditions. Bedding-cleavage intersection lineation. A fine striation lineation on bedding planes or a faint colour striping or compositional banding on slaty cleavage planes, resulting from the intersection of slaty cleavage with bedding. Biofacies. A rock unit which contains an assemblage of fossil features reflecting the conditions of origin of the rock. Biogenic. Produced by organic means. Biostratigraphy. A branch of Geology dealing with the sequence and correlation of rocks by the use of fossils. Bioturbation. A process whereby animals moving or resting on or in sediment produce structures there. Blaes. A grey-blue somewhat carbonaceous shale or mudstone. Bole. Red argillaceous horizons found on top of basalt lava flows, indicative of extrusion and weathering in a tropical climate. Bostonite. An intermediate igneous dyke rock, often porphyritic, whose groundmass comprises mainly flow-oriented orthoclase laths. Boudinage. A structure resulting from deformation whereby a competent layer enclosed in less competent rocks is extended or broken at regular intervals into a series of isolated segments. Bouma sequence. An idealised section through a turbidite deposit comprising from top to bottom (E) mud (D) mud and silt (C) small-scale cross-bedding (B) planar laminations and (A) a massive unit sometimes showing graded bedding. Members may well be missing, but those present are in the correct order. Bowlingite. A secondary mineral derived from the hydrothermal alteration of olivine. It is of variable composition and is frequently found together with the alteration products iddingsite and serpentine. Brockram. A sedimentary rock made up of coarse angular fragments (breccia) specifically of New Red Sandstone age. Buchite. A metamorphic rock formed by partial or complete melting (vitrification) under high temperature contact metamorphic conditions (pyrometamorphism) of shale or shaley-sandstone, either in place or as xenoliths. Cordierite is commonly developed within the vitrified rock. Cementstone. A sedimentary rock, an argillaceous dolomitic limestone. Chalcedony. A mineral composed of finely crystalline and amorphous silica. It is usually light coloured with a waxy appearance. Chert. An opaque, dark-coloured variety of chalcedony (see above), usually occurring in massive or stratified form among sedimentary rocks. Chitinozoa. Fossils of uncertain affinity, but may be egg cases of extinct worms. Chlorite. A mineral, a hydrous silicate with aluminium, magnesium and iron. Usually greenish in colour and greasy to touch. Cirri. Flexible appendages attached to the stem of a crinoid. Clastic. Sediments composed of broken fragments of pre-existing rocks. Cobbles. Rounded rock fragments which are coarser than pebbles and finer than boulders, i.e. between 64 and 256 mm. Conodonts. Microscopic (< 2mm) phosphatic tooth-like structures: widespread in marine sediments of Cambrian to Jurassic age: important strati-graphically; considered by some to be related to primitive vertebrates. Coralla. The calcareous skeletons of corals. Cordierite. A primary metamorphic mineral formed in high grade hornfelses, surrounding igneous intrusions, at high temperatures and relatively low pressures. It is an alumino-silicate containing magnesian and iron, blue in colour. It may also occur in some regional metamorphic rocks. Cornstone. A rock, a concretionary limestone resembling a desert-type soil, where groundwater saturated with calcium carbonate is brought to the surface by capillary action during a desiccation period. Corundum. A mineral, an oxide of aluminium, extremely hard and often crystallising with a barrel-like shape. Crag and tail. A landform produced by moving ice meeting a solid rock obstruction (the crag), passing over and around the obstruction, and leaving a tapering mass of unconsolidated debris (the tail) on the 'downstream' side of the obstruction. Crenulation cleavage. A regular, often closely-spaced, planar fabric in micaceous rocks formed by the microfolding or plication of a pre-existing cleavage. Crenulation lineation. An alignment of small plications (on a mm or smaller scale) seen on bedding or cleavage surfaces, which commonly results from the intersection of a crenulation cleavage with these surfaces. Crinanite. A medium-grained igneous rock which is a variety of analcimebearing dolerite: cf teschenite. Cross strata. Sets of strata which are inclined to the general stratification of the beds. They dip in the local direction of fluid flow at the time the beds were laid down. Cumbraite. An igneous dyke rock composed of phenocrysts of calcium-rich plagioclase feldspar in a groundmass of other minerals and glass. The rock is very dark in colour. Cuprite. A mineral, red oxide of copper, found in the upper oxidised zones of copper lodes. Curvilinear. Applied to folds, this term denotes that the fold hinges have a curved form in 3-D, varying in both amount and direction of plunge. Cuvettes. Basins of deposition, particularly those which existed in the Old Red Sandstone. Dalmeny (basalt). An igneous rock with microphenocrysts of olivine, augite and plagioclase, in a fine-grained groundmass. Dextral fault. A term which refers to a strike slip fault where the ground on the other side of the fault from the observer has moved to the right. Diachronism. A term referring to a situation where a rock unit systematically changes its age as it is traced out laterally. Diagenesis. The chemical, physical and biological changes undergone by a sediment during its transformation into rock. Disharmonic. Refers to folds which do not have a consistent wavelength and amplitude, and show abrupt changes in profile where they affect different layers in a sequence. Drumlin. A hill of till (boulder clay), whale-backed in shape, and elongate in the direction of ice movement. Druse (drusy). A term referring to a rock cavity into which well formed crystals have grown. Dunsapie (basalt). An igneous rock with macrophenocrysts of plagioclase, augite and olivine in a finer-grained groundmass. Esker. A long winding ridge of sand and gravel deposited by glacial meltwater streams underneath or within the ice-mass. Essexite. A variety of alkali gabbro, notable for its prominant augite phenocrysts. Facies. Part of a sedimentary rock unit, characterised by lithological and fossil features which differentiate it from other parts of the unit, and reflect the enviroment of origin. Facing. A term used in structural geology, referring to the orientation of the structure. A fold faces in the direction along the axial plane of a fold, at right angles to the hinge, in which the beds become younger. Felsite. An igneous rock, light-coloured and extremely fine-grained with a chemical composition similar to a granite. Fenestrate. With small window-like openings between branches, in a net-like arrangement. Fireclay. A fine-grained sedimentary rock, usually grey and friable and low in alkalis. It often contains fossil plant roots, commonly occurring beneath a coal seam. It is a fossil soil. Flexural (fold). A fold in which the rock deformation has been produced by movement along planes of weakness. Fluorite. A mineral, calcium fluoride, often found as cubes. Flow banding. A texture occurring in some fine-grained igneous rocks, usually granitic in composition, and due to viscous flow segregation or streaking of the constituents of the magma. Flute cast. Bulbous cast (generally in sandstone) of an erosion hollow (generally in mudstone). This is found most frequently in turbidite deposits, where sands infill the fluted' surfaces of muds. Flysch. A thick marine sedimentary sequence, essentially comprising shales and greywacke sandstones deposited from turbidity currents. Origin considered from erosion of rapidly rising fold mountains and then itself becoming folded: a syngenetic deposit. (A term originally restricted to the Swiss Alps). Foliation. A structure of metamorphic rocks where minerals in the rock have been either segregated into bands or have acquired some degree of common orientation: a combination of compositional layering and schistosity. Geopetal. A term referring to a cavity (generally quite small), the lower part of which is filled with sediment (sometimes layered); and the upper part of which is filled with mineral growths. The flat top of the sediment is parallel to the horizontal at the time of formation and can therefore be used as a 'way-up' structure. Geosyncline. A major structural downwarp in the Earth's crust which has been infilled with sediment. Graben. A block of ground which has been downthrown between two parallel faults, ( cf. Horst ). Graded bedding. A structure referring to beds or layers in rocks which show a gradation in grain size from bottom to top (often coarse at base and fine at top). Grainstone. A carbonate rock composed of sand-sized particles which are in contact and which support one another. Greywacke. A sedimentary rock, a poorly sorted sandstone made up of quartz, feldspar and rock fragments. Groove cast. Elongate ridge on the base of a bed (generally sandstone) which is the cast of an elongate hollow in the underlying rock (generally mudstone). Hard ground. Sea bed sediment which is lithified to form a hardened surface. It implies a gap in sedimentation. Harzburgite. An ultrabasic rock (peridotite) composed essentially of olivine and orthopyroxene. Hatchettite. A naturally occurring hydrocarbon mineral, found as a soft, yellow-white translucent paraffin wax in crevices of septarian concretions, and in geodes. Also known as mountain tallow, or mineral adipocere, it is named after the chemist C. Hatchett. Hawaiite. A volcanic igneous rock somewhat richer in alkalis and silica than alkali-basalt. It is a member of the series alkali-basalt, hawaiite, mugearite, benmoreite, soda-trachyte. Heulandite. A reddish brown hydrated silicate mineral containing aluminium, calcium and sodium: it is a member of the zeolite family of minerals. It is a characteristic mineral of amygdales in basalt where it is associated with stilbite. Hillhouse (basalt). An igneous rock with microphenocrysts of olivine and augite in a finer-grained groundmass, itself rich in augite. Holocene. The Holocene Epoch is the last part of geological time, spanning the interval from 10,000 radiocarbon years B.P. (Before Present) to the present day, 1950 A.D. being 'Present' in the radiocarbon timescale. Holocrystalline. A texture of igneous rocks, where the rock is entirely crystalline. Hornfels. A metamorphic rock produced by thermal metamorphism of fine-grained rocks usually of sedimentary origin. Horst. An area which has been upthrown between two parallel faults (cf Graben). Hyalotuff. A deposit formed from the extrusion of lava into water or wet sediments and its consequent shattering into glassy fragments. Ice wedges. Wedge shaped masses of sediment occupying hollows once filled by ice. Isotopic Stages. Quaternary time intervals (of unequal length), established on the basis of variations in the relative abundance of the two isotopes of oxygen, 016 and 018, in the world's oceans during the Quaternary period. Iddingsite. A mineral, a hydrated silicate of iron and magnesium. Involution. A form of contortion in sediments, which are often synclinally or vertically folded. Isograd. A line on a map joining points of equal grade of metamorphism. Isopach. A line on a map joining points where the intervals between two stated reference planes bounding rocks are equal. In this way the thickness distribution of a rock unit can be represented. Jasper. A mineral, often red/yellow in colour, comprising very fine crystalline silica. Kaersutite. A mineral belonging to the amphibole (hornblende) group. Dark (brown/black) in colour: previously known as barkevikite. Keratophyre. An igneous rock, an albite (plagioclase feldspar) bearing trachyte or rhyolite. Kink bands. Angular, asymmetric minor folds which occur in linear zones and are commonly from conjugate sets. Larvikite. A coarse-grained igneous rock of syenitic composition comprising mainly anorthoclase feldspar showing blue iridescence (schiller structure). The ferro-magnesian minerals occur in patches, made up of titanaugite, ferro-olivine, biotite, apatite and magnetite. A commonly used ornamental stone. Listric faults. Curved normal faults in which the the fault surface is concave upwards. A succession of such faults may develop within the hanging wall as 'rollover antiforms'. Lithic sandstone. A sedimentary rock, sandstone, which is partly made up of rock fragments. Lithosome. An accumulation of sediments deposited under uniform physiochemical conditions. Load cast. A sedimentary structure, generally bulbous and rounded, formed when sand (usually) founders and injects into the underlying strata (usually mud). Lodgement till. An unsorted mixture of sediment which has been deposited at the base of an ice sheet or glacier. Lugarite. An igneous rock comprising kaersutite and titanaugite in a grey-green matrix which is made up largely of nepheline. Malachite. A mineral, green copper carbonate, which occurs as a secondary mineral in the weathered zone of copper deposits and is usually banded. It is often associated with azurite, (blue copper carbonate). Mandibles. Jaw parts of arthropods. Markle (basalt). An igneous rock with large crystals (macrophenocrysts) of plagioclase feldspar (labradorite) in a finer grained groundmass. Marl. A sedimentary rock, a calcareous mudstone. Mélange. A heterogeneous rock type in which a variety of exotic rock clasts are contained in a pervasively foliated fine-grained matrix. Mesoscopic structure. A structure seen at the scale of an outcrop (between microscopic and megascopic) : Greek mesas : intermediate. Metabentonite. An altered bentonite, which is a clay deposit formed from the devitrification of volcanic ashes of glassy composition. Metaquartzite. A metamorphic rock: a quartzite formed by metamorphic recrystallization. Microlite. Small, needle-like incipient crystal, found in glassy igneous rocks. Microlithon. One of the elements of a spaced cleavage. It consists of narrow slices of rock, generally a few mm thick, which are separated by cleavage planes and preserve the earlier mineralogy and tectonic fabric (often crenulated) of the rock. Microperthite-adamellite. Microperthite is a fine intergrowth of various feldspars: ( albite or oligoclase into orthoclase or microcline); and an Adamellite is a granitic rock in which plagioclase feldspar (albite/ oligoclase) and potash feldspar (orthoclase) are present in roughly equal amount. Microphyric. A texture in which the phenocrysts are small. Millerite. A brass-coloured mineral generally occurring as fine hairlike crystals. A nickel sulphide, NiS. Moraine. The accumulations of materials which have been transported and deposited by ice. Monchiquite. A soda-rich igneous rock comprising phenocrysts of biotite, hornblende, augite and olivine in an analcime-rich groundmass. Typically, feldspar is absent. Microphenocryst. A small crystal present in a groundmass of even finer crystals. Mugearite (basalt). An igneous rock, with small crystals of olivine and soda-rich plagioclase (oligoclase) in a finer grained groundmass. Mullite. A mineral, aluminium silicate, forms prismatic crystals, resulting from high grade metamorphism of argillaceous rocks. Nappe. A geological structure, a fold with the axial plane horizontal or nearly so. In this volume, the term refers to a flat-lying fold of regional dimensions. Natrolite. A white hydrated silicate mineral containing aluminium and sodium, a member of the zeolite family of minerals. It occurs in vesicles, cavities and amygdales in basaltic rocks, being deposited from hydrothermal solutions. Nepheline. A mineral, alkali aluminium silicate. Occurs as small glassy crystals, or as interstitial material in the groundmass of undersaturated igneous rocks (eg. theralite). Neritic zone. The shallow-sea environment from low water down to 200 m (100 fathoms). Obduction. The large scale thrusting of oceanic crust onto a continental margin. Olistostrome. A massive and chaotic conglomerate which accumulated in deep water as a result of large-scale slumping. Oolitic. A texture referring to ooliths, which are small spherical concentrically layered grains, <2 mm. in diameter. They occur typically in certain limestones, hence oolitic limestone. Ophiolite. An association of basic and ultrabasic igneous rocks consisting of basaltic pillow-lavas, dolerite dykes, gabbros and peridotites (serpentinites), together with pelagic sediments (eg. radiolarian cherts). They probably represent segments of oceanic crust obducted on to a continent by Plate collisions. Ophitic. Texture of basic igneous rocks, where large plates of augite enclose earlier-formed, well shaped, smaller crystals of plagioclase feldspar. Ossicles. The calcified skeletal units, especially stem units, of crinoids. Ostracode. A microfossil belonging to the arthropod group. Palaeokarst. A topography formed on limestone, by solution, at some time before the present. Palaeocurrents. The direction of flow taken by currents of former times, as they deposited sediments. Paraconformity. A term referring to an unconformity where there is no visible discordance between the beds on either side of the break. Paragenetic sequence. The order in which minerals are deposited. Pegmatite. An igneous rock, very coarse grained, often associated with granite and usually occurring as a segregation vein or dyke. Petite. A rock, argillaceous, now used almost exclusively by metamorphic petrologists to describe the fine grained sedimentary rock before its metamorphism. Peridotite. An igneous rock composed largely or entirely of olivine, together with other ferro-magnesian minerals and devoid of feldspar. Phenocryst. Refers to any large, well formed crystal, which occurs in a finer grained groundmass in an igneous rock. Phyllite. A metamorphic rock, resulting from regional metamorphism of an argillaceous sedimentary rock. A fine-grained rock with a silky sheen, which is intermediate in appearance and physical properties between slate and mica schist. Picrite. An igneous rock, in which ferro-magnesian minerals such as olivine, augite and hornblende predominate. Pisolite. A rock made up of pisoliths, which are spherical, concentrically layered grains 3-6 mm. in diameter (cf. oolite). Playa. A flat, clay surfaced inter-montane basin. Pod-shrimp. Oldest and most primitive of higher crustaceans (shrimps and lobsters), characterised by a large, laterally compressed carapace, or head-shield, enveloping the front regions of the body, an extra, seventh abdominal segment, and with a trifid tail-piece instead of a tail-fan. Porphyritic. A texture of igneous rocks, describing large often well-shaped crystals in a finer grained groundmass. Porphyroblast. Large, often well formed crystals which have grown in rocks during metamorphism. Prehnite. A silicate mineral containing calcium and aluminium, it occurs in amygdales in basalts in association with other zeolite minerals.lt is pale green in colour and occurs in botryoidal masses with a radiating fibrous structure. Pressure solution. A process by which grain boundaries at right angles to the local principal compression direction are preferentially dissolved and the material (usually quartz and calcite) is either redeposited locally or removed from the rock via the pore fluid. Prod and skip casts. Structures which are the casts of impact marks produced by suspended components in a current (eg. empty shells) as they impinge on the underlying bed. Protolith. An original Ethology which has been converted by metamorphism or metasomatism into a different, secondary rock type. Provenance. A place of origin, in particular the area or region from which the constituents of a sedimentary rock fades were derived. Psammite. A metamorphosed feldspathic sandstone with a low mica content. Quartz feldspar porphyry. An acid igneous dyke rock composed of large quartz and feldspar crystals in a finer groundmass. Quartz fibre lineation. Lineation comprising fibres of optically continuous quartz which have grown parallel to the local extension direction in the rock. Ramp. The transgressive portion of a thrust where it changes stratigraphic level. Radiolaria. Small marine planktonic organisms with silica tests. Red bole. See Bole. Rhyolite. An acid igneous rock, very fine grained and often displaying flow banded structures. Roche moutonnee. An asymmetrical rock mound with a smooth slope on one side and a rough slope on the other. It is caused by ice erosion, the ice moving towards the rough slope. Rodingite. Altered dolerite dyke, comprising augite with schiller structure and garnet. Sanidine. A mineral, a high temperature variety of potassium/sodium feldspar. Schistose grit. A metamorphosed clay-rich coarse-grained sandstone that resembles a schist in its foliated appearance but is coarser-grained than most schists. Sclerosponge. A sponge with a layered calcareous skeleton. Scolecodont. A part of the jaw apparatus of marine worms. Scoriaceous. A texture of lavas or pyroclastic rocks which is typified by irregular vesicular cavities. Seat earth. A bed of rock underlying a coal seam, representing an old soil that supported the vegetation from which the coal was formed. Septarian. A structure developed in some concretions consisting of an irregular polygonal system of internal cracks, which are usually occupied by calcite or other secondary minerals. Sericite. A mineral, a very fine grained form of mica, resulting often from the alteration of another mineral. Sinistral fault. A term which refers to a strike-slip fault where the ground on the other side of the fault from the observer has moved to the left. Slaty cleavage. A pervasive fine-grained cleavage (or plane of splitting) developed in low-grade metamorphic rocks, and especially in mudrocks. Slickensides. A polished rock surface, frequently striated with linear grooves and ridges, found on fault planes caused by the movement of adjacent blocks. Slickenside lineation. Lineation, either mechanical in origin or due to the growth of quartz or calcite fibres, found on a slickenside. Sole markings. A group of structures which commonly occur at the bases (soles) of turbidites. ( See Flute cast and Groove cast ). Spaced cleavage. A cleavage in metamorphic rocks which consists of alternating light coloured (quartz-rich) stripes and thinner, dark-coloured (mica and chlorite) domains. Sphaerosiderite. A mineral, iron carbonate, in spherical grains with radiating fibres. Spilite. An igneous rock of basaltic type, but rich in albite and chlorite, the latter derived from the alteration of ferromagnesian minerals. Spilites are generally, but not necessarily, found in pillow lavas. Spinel. A mineral, magnesium aluminate, commonly occurring as small octahedra. Stretching lineation. A metamorphic term defining very fine discontinuous and streaky-looking lineation found on cleavage planes, which results from the elongation or 'stretching' of small rock particles parallel to the X-direction of the strain elipsoid during deformation. Strontianite. A pale-green mineral, strontium carbonate. Stromatoporoids. Palaeozoic fossils which belong to the same group as corals, with which they show some similarity. Stylolitic. An irregular, interlocking surface, resembling a zig-zag line in cross section. It is produced by pressure solution along cracks in limestones. Subgreywacke. The commonest type of sandstone, intermediate in composition between greywacke and orthoquartzite, containing less than 75% quartz, more than 25% of unstable fragments (feldspar and rock) and less than 15% detrital clay matrix. Synform. A structural term denoting that a fold closes downwards in strata for which the stratigraphic sequence is not known. Terrigenous. Refers to rocks which have either been formed of material eroded from the land, or deposited on the land. Teschenite. An igneous rock of gabbroic type containing analcime. Theralite. An igneous rock of gabbroic type containing nepheline. Titanaugite. A mineral, a titanium-rich variety of augite. Tholeiite (basalt). An igneous rock saturated or slightly oversaturated with silica, hence is olivine free and may contain intersertal quartz in the groundmass. Thomsonite. A snow-white hydrated silicate mineral containing aluminium, calcium and sodium: it is a member of the zeolite family of minerals. It commonly occurs in cavities in basaltic rocks, being deposited from hydrothermal solutions. Thrust duplex. A schuppen or imbricate structure with lower and upper bounding thrusts. Torbanite. A sedimentary rock, resembling an oil shale, and apart from the argillaceous material consists of carbonaceous material of algal origin. Tourmaline. A mineral, composed of a complex borosilicate of aluminium. It occurs normally as black prismatic crystals. Trachyte. A fine-grained igneous rock, intermediate in composition but may contain a little quartz. Usually light in colour and characterised by the alignment of small feldspar laths (hence " trachytic texture"). Trachybasalt. An igneous rock, basalt, in which the alkali and calc-alkali feldspars are present in roughly equal amounts. Transposition. The rotation of a pre-existing surface (bedding or foliation) into an orientation approximately parallel to the axial plane of folds; it is achieved by such processes as extreme flattening, development of axial plane foliation and segmentation of marker beds or layers. Tridymite. A mineral, the stable fonn of silica between 870 and 1470 C; colourless to white. Trondhjemite. An igneous rock of granodioritic composition but potash-feldspar free, soda-feldspar rich and usually very low in ferro-magnesian minerals. Tuff. A rock, formed of consolidated volcanic ash, finer grained than an agglomerate. Turbidite. A rock which was formed from material deposited by a turbidity current, that is a flow of dense sediment and water, typically occurring on the continental slopes. Vergence. The direction in which the next major antiforrnal fold is located, as deduced from the apparent sense of rotation shown by minor folds of the same age found on the limbs of the structure. Vesicles. Small spherical or elipsoidal cavities in an igneous rock, formed by escaping gases. White trap. A carbonated dyke rock, originally basaltic in most cases. Xenocryst. A crystal in an igneous rock, larger than the groundmass, but unlike a phenocryst it has not grown from the magma, but rather has been incorporated into the melt from elsewhere. It often displays corrosion around its margins. Xenolith. An inclusion of pre-existing rock into some igneous rock. Zeolites. A group of minerals, hydrated silicates of calcium and aluminium. They often occur as secondary minerals filling cavities and joint spaces. Zircon. A mineral, zirconium silicate, an important ore for zirconium, hafnium and thorium. Found as an accessory mineral in the more acid igneous rocks; also as a detrital mineral. Some varieties are used as gemstones. This page was last modified on 12 February 2019, at 00:33.